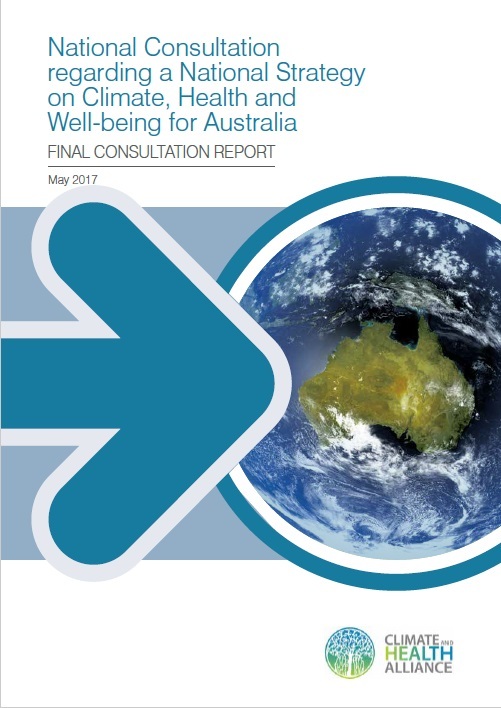 The report on our final consultation with health stakeholders regarding our proposed National Strategy on Climate, Health and Well-Being is now available. This report details the outcomes from a consultation led by CAHA with professional health and hospital groups, senior health leaders, academics, scientists, parliamentarians and policymakers as well as doctors, nurses, midwives, public health practitioners and psychologists throughout 2016. Consultation revealed deep concerns about the effects of climate change within the health community and the desire for urgent federal leadership and action. As the world watches climate disruption unfolding, health protective climate policies are now crucial. A Health Leaders Roundtable and Meeting with Parliamentarians in Canberra (October 2016). Responses demonstrate the firm view among health groups that without a National Strategy on Climate, Health and Well-being, Australia will fail to meet its obligations to the health of its citizens under the global climate covenant, the Paris Agreement. The consultation reveals a strong commitment from health groups to work together with governments and political parties across the political spectrum to “make the strategy happen”. Access the Final Consultation Report on our website now. Download the accompanying Media Release here. Copyright © 2017 Climate and Health Alliance, All rights reserved.